A Prunus persica (L.) Batsch. cultivar. ‘Fruit below the middle size, globular, flattened, deeply cleft on one side. Skin pale yellowish white next the wall; but of beautiful red on the sunny side. Flesh quite white, with a little red at the stone, from which it separates. Juice plentiful, rich, and vinous. Stone blunt, rather large in proportion to the size of the fruit. Ripe the end of August or beginning of September. This is a very excellent Peach, and ought to be found in every good collection of fruit.’ [George Lindley – Orchard Guide p.262/1831]. ‘An excellent variety, ripening in the end of August or beginning of September, about the time of the Grosse Mignonne. It is very different from the Red Magdalen Peach of the Nurseries, which is a larger fruit, with more colour, and small flowers. The tree is rather subject to mildew. According to Mr. Lindley, this is the true Red Magdalen Peach of Miller. It is remarkable for its fine, rich, vinous flavour.’ [PM t.30/1828]. The figure given in the Pomological Magazine is used as illustration here. 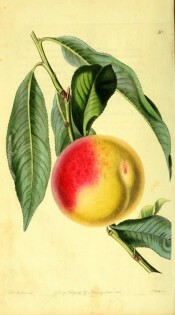 This peach only appears in the record as a parent of ‘Camden Superb’, which see, but it was almost certainly grown in the gardens at this time. [MP A2933-1, p.185]. There is doubt about this identification as two peaches went under the name of ‘Red Magdalen’ at this time, the above and an apparently inferior peach of this name. ‘Flowers small, dark dull red. Fruit middle-sized, rather more broad than long. Suture deep, extending nearly half an inch beyond the centre of the apex; swelled much more on one side of it than on the other, and having wide cavity at the base. Skin pale yellowish white next the wall, but of a very deep red, interspersed with a few ash-coloured and dark specks on the sunny side. Flesh melting and white, but red at the stone, from which it separates. Juice plentiful, and of a very good flavour. Stone oblong and thick. Ripe the beginning of September. This is a good peach, but apt to be mildewed when planted upon a cold soil. I have not quoted any synonyms under this head; for, although it may have been sold under different names by different nurserymen, it does not follow that these names should be considered as synonymous.’ [George Lindley – Orchard Guide p.268/1831]. This is probably synonymous with ‘Royal George’, which see, and could well be Macarthur’s ‘Red Magdalen’.